A lake, stream, or ocean can be a lifesaving resource in a disastrous situation. Most large water sources can provide food resources, including fish. 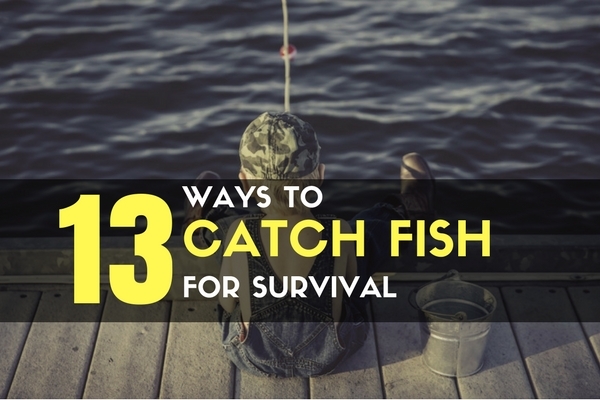 Catching fish for survival can be trickier than you may think. The pressure to catch fish can get to you, and a string of bad luck could leave you with an empty belly. Stay in control of the situation, and pivot to a different fishing technique if one isn’t working out for you. Different techniques are more effective for different types of fish in various regions of the country. 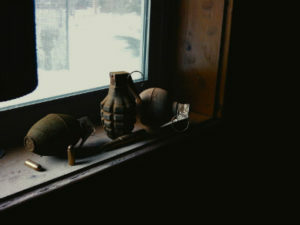 A few of the options we list below are not legal in many places, and should only be used in those regions for survival. Whether you are fishing with your favorite fishing pole or making one from scratch, a pole is the go-to solution for catching fish. 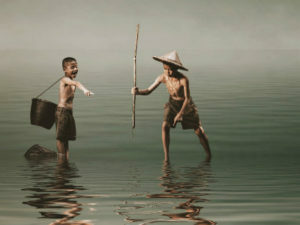 One major downside of a fishing pole is that holding a fishing pole usually keeps you from doing other survival priorities. Passive ways to catch fish for survival may be more valuable for you than your usual fishing trip. You will need to free up time and calories for other survival priorities whenever possible. Fishing Weir – Make a maze or block a stream or river to trap fish moving up or downstream. Eel Trap – Weave a basket with a small, inverted opening in one end. This trap is often demonstrated in survival shows and takes skill and time to construct using bushcraft methods. Soda Bottle – Use a two liter coke bottle to easily make a trap. Spring reels are cheap, don’t take up much space, and are quick to set up. They are self contained, with the line and lead always wound up. This makes them compact, clean, and portable, making them great for car kits or INCH bags. It sounds ridiculous, but we’re serious. Rocks are not just for traps when it comes to catching fish. A well timed medium sized rock in shallow water can easily stun or kill a fish. Bowfishing is one more way to make the versatile bow and arrow have even more uses. While we talk about active and passive fishing techniques on the list- this is the most active of them all. It takes a good amount of skill and energy to nail a fish with an arrow. Refraction of the water makes it hard to hit fish deep, even if the water is clear and the fish are visible. Although extremely difficult and ill advised, you can shoot fish. Like bowfishing, you need to account for refraction when aiming your shot. A vertical shot is the only angle where this is not a problem. Not many people have a spear laying around, but there are a few different methods you can use to make a fishing spear on the go. Crafting a spear out of a branch is pretty easy with some lashings and a little bushcraft skill. Fish are pretty easily cornered in shallow water. You can use a weir trap to help you out, but herding some fish and then just grabbing or flipping them on the shore is an easy way to get a quick meal. Limb lines are a great way to catch catfish and can work on other freshwater fish well too. Tie your line to a tree limb that goes over the water and keep the bait and hook just under the water. This will help it dance and make noise which will attract fish. Some even prefer to ‘set’ the limb under tension like a trap trigger. When triggered, the limb will pull up much like the spring reel, setting the hook firmly. Limb lines are a quick way to catch fish without having to be there. A trot line is similar to a throw line, but with a whole lot more hooks and it is usually made out of a sturdier line or even cable. Most trot lines are 50-100 feet and you can get a lot of hooks on that length. Like limb lines, they are often used to catch catfish and need to be sturdy enough to hold several fish at once. While they may take a good amount of setup time and materials, a trot line can catch tons of fish. It is a great passive way to catch fish. Attaching a jug to a line and tossing in a baited hook is a quick way to drop a line when you don’t have to worry about current. Like the few listed above, jug fishing is used often to catch catfish. And like some of the better techniques on the list, you can drop your jugs off in the morning and pick them up at dusk- a great ‘fire and forget’ method. Cast nets, drag nets, gill nets- most nets can change the game when it comes to getting fish. It is one of the easiest ways to catch fish of any size, from bait fish to an entire seafood meal. Gill nets are the preferred net for survivalists because they are a net you can set up and come back to, rather than having to toss or drag it yourself. Explosives can shock and stun fish in a large area. While this is loud, dangerous, and illegal in most places- it is still a way you could catch fish if you had spare explosives laying around. It is not the most practical way to catch fish for survival, but it is a way that works so it makes the list. You aren’t trying to blow up any fish here; they won’t be too edible if you do that. A small underwater explosion should give a good enough concussion to the fish to confuse or stun them, making them easy to collect. 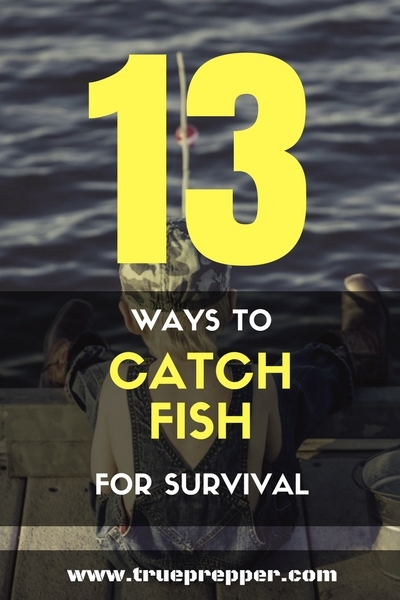 Fish are a great food resource and can be plentiful in some bug out locations. If you don’t have the gear you are used to; don’t let that hold you back from staying fed! There are a few methods that we kept off of the list just due to their practicality. Fishing with chemicals is possible- but not very safe for consumption. Keep exploring, stay prepared, and be safe. What about the use of certain plants that poison or deplete the oxygen level, I think ground up acorns will do the trick. Not sure bout acorns, Yucca plants will work, as will the hulls of Black Walnuts.